This morning I went out to the Denton area to find the Williams Creek (aka Means) Tunnel. Fork Road and but then turns and runs just to the west of Hogshead Hollow Road. The first two photos were taken about a mile up Hogshead Hollow, west on Cemetery Road where it crosses the ROW. the ROW through the short passage to the tunnel entrance. 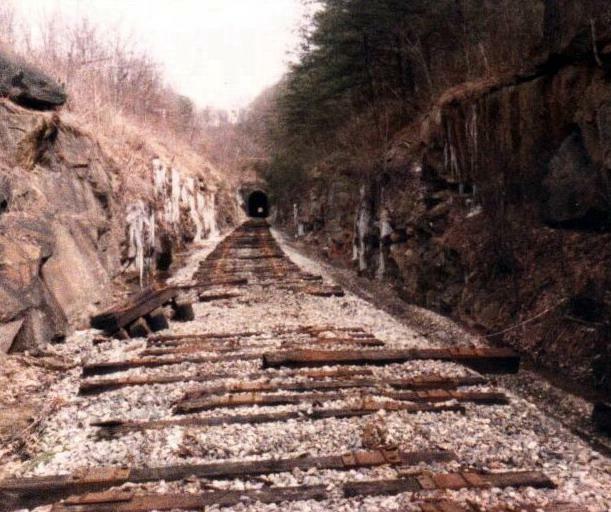 Photo six shows an interesting 20 foot high rock face just to the north (left) of the ROW immediately in front of the tunnel. seriously doubt that. By my very rough estimate, I would guess that the tunnel is less than 1,500 feet long. framing may have already compromised the integrity of the tunnel support structure. The last photo shows a thermometer that someone has left in the tunnel. This tunnel appears to be quite a bit narrower than the Aden Tunnel. Note the rectangular plates with the four holes in them laying on the ties. and they more evenly distributed the load and forces over the the surface of the sleepers, greatly lengthening the life of the ties.